Decoration 4 large initials in colours with interlace and bird head decoration, and display script, at the beginning of Matthew, the capitula to Matthew, Mark, and Luke (ff. 15, 15v, 55, 84). Smaller initials in ink with interlace decoration at the beginning of John, prologues, and other lists of capitula (ff. 1, 2v, 3v, 4v, 5, 8, 52, 128, 130v). Canon Tables with arcades decorated with human, animal, or bird heads, and interlace motifs (ff. 9-14). Initials in red. Binding BM/BL in-house. Rebound in 1983. Provenance Added corrections 'diens', and 'ferebant' correcting 'dicebant', 9th century caroline minuscule (ff. 55, 75); and added punctuation (ff. 73-77). Added Old English text of manumission by King Athelstan of c. 925, stating that king Athelstan freed Eadhelm very soon after he first became king, in the presence of five witnesses: Aelfheah, a priest, probably the future bishop of Wells from 926, Aelfric, the reeve, Wulfnoth, the whist, Eanstan, the provost, and Byrnstan, a priest, probably to be identified with future bishop of Winchester from 931, 10th-century square minuscule (f. 15v). Added sketches of a standing figure between columns (f. 4) and hands (f. 112) in dry point, 12th century. The Old Royal Library (the English Royal library): included in the catalogue of 1666, Royal Appendix 71, f. 3; and in the 1698 catalogue of the library of St James's Palace (see [Edward Bernard], Catalogi librorum manuscriptorum Angliae et Hiberniae (Oxford: Sheldonian, '1697', but 1698? ), no. 7897). The manuscript contains a text of a manumission by King Athelstan, one of the earliest of the Anglo-Saxon examples of the practice of inserting records in sacred books. It was believed to be the book on which Athelstan swore his coronation oath in 925 in Canterbury Cathedral, but no certain evidence supports this hypothesis (see discussion Keynes 1985). Humphrey Wanley suggested that it belonged to Christ Church, Canterbury (see 'Antiquæ literaturæ Septentrionalis liber alter', in George Hickes Linguarum Vett. Septentrionalium Thesaurus Grammatico-Criticus et Archæologicus, 2 vols (Oxford: Sheldonian, 1703-1705), p. 181). 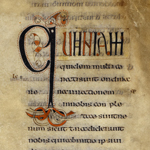 It has been suggested that the manuscript may have been copied from the same exemplar as the Lindisfarne Gospels (see discussion Pfaff 2009). Quire signatures in the form of Roman numerals, Canon Tables (ff. 9-14) not included in the numeration; crosses in the top left-hand corner of the first recto of a quire. Ammonian sections marked in the margins. A CD of the entire manuscript is available in the Manuscripts Reading Room. Select bibliography [E. Maunde Thompson and G. F. Warner], Catalogue of Ancient Manuscripts in the British Museum, 2 vols (London: British Museum, 1881-1884), Part II Latin, pp. 19-20, pl. 7. F. C. Kenyon, Facsimiles of Biblical Manuscripts in the British Museum (London, 1900), no. XII. M. R. James, The Ancient Libraries of Canterbury and Dover (Cambridge, 1903), p. 532. British Museum Bible Exhibition 1911: Guide to the Manuscripts and Printed Books exhibited in Celebration of the Tercentenary of the Authorized Version (London: British Museum, 1911), no. 13. George F. Warner and Julius P. Gilson, Catalogue of Western Manuscripts in the Old Royal and King’s Collections, 4 vols (London: British Museum, 1921), I, pp. 10-11. H. H. Glunz, History of the Vulgate in England from Alcuin to Roger Bacon (Cambridge: Cambridge University Press, 1933), p. xiii. Codices Latini Antiquiores, ed. by E. A. Lowe, 11 vols (Oxford: Clarendon Press, 1934-1966), II: Great Britain and Ireland (1935), no. 213. Theodor Klauser, Das römische capitulare evangeliorum: Texte und Untersuchungen zu seiner ältesten Geschichte, Liturgiegeschichtliche Quellen und Forschungen, 28 (Munster: Aschendorffschen, 1935), p. XXXII, no. 13. G. L. Micheli, L’enluminure du haut moyen age et les influences irlandaises (Brussels: Editions de la connaissance, 1939), pp. 26, 46, 103, 128, 215. N. R. Ker, Catalogue of Manuscripts containing Anglo-Saxon (Oxford: Clarendon Press, 1957), no. 246. Patrick McGurk, Latin Gospel Books from A. D. 400 to A. D. 800 (Paris: Érasme, 1961), no. 28. J. J. G. Alexander, Insular Manuscripts: 6th to the 9th Century, A Survey of Manuscripts Illuminated in the British Isles, 1 (London: Harvey Miller, 1978), no. 20. Bonifatius Fischer, Lateinische Bibelhandschriften im frühen Mittelalter, Vetus Latina, 11 (Freiburg: Herder, 1985), pp. 69, 173. Simon Keynes, 'King Athelstan's Books', in Learning and Literature in Anglo-Saxon England: Studies Presented to Peter Clemoes, ed. by Michael Lapidge and Helmut Gneuss (Cambridge: Cambridge University Press, 1985), 143-201 (pp. 185-89, pl. XI). Bonifatius Fischer, Die Lateinischen Evangelien bis zum 10. Jahrhundert, 4 vols (Freiburg: Herder, 1988-1991), I: Varianten zu Matthäus, Vetus Latina die Reste der Altlateinischen Bible: Aus der Geschichte der Lateinischen Bibel, 13, p. 15 (as 'Nr'). Christopher D. Verey, ‘The Gospel Texts at Lindisfarne at the Time of St Cuthbert’, in St Cuthbert: His Cult and His Community to AD 1200, ed. by Gerald Bonner, David Rollason, and Clare Stancliffe (1989), pp. 143-50 (pp. 148). Michelle Brown, Anglo-Saxon Manuscripts (London: British Library, 1991), pls 45, 53. The Making of England: Anglo-Saxon Art and Culture AD 600-900, ed. by Leslie Webster and Janet Backhouse (London: British Museum, 1991), no. 84 [exhibition catalogue]. David N. Dumville, Wessex and England from Alfred to Edgar: Six Essays on Political, Cultural and Ecclesiastical Revival, Studies in Anglo-Saxon History, 5 (Woodbgidge: Boydell, 1992), pp. 93-94, 157, n. 103, 191-92. Patrick McGurk, ‘The Disposition of Numbers in Latin Eusebian Canon Tables’, in Philologia Sacra: Biblische und patristische Studien für Hermann J. Frede und Walter Thele zu ihrem siebzigsten Geburtstag, ed. by Roger Gryson (Freiburg: Herder, 1993), pp. 242-58 (p. 248). Biblical Commentaries from the Canterbury School of Theodore and Hadrian, ed. by Bernhard Bischoff and Michael Lapidge, Cambridge Studies in Anglo-Saxon England, 10 (Cambridge: Cambridge University Press, 1994), 156-58, 160 n. 118. Richard Gameson, ‘The Royal 1 B VII Gospels and English Book Production in the Seventh and Eighth Centuries’, in The Early Medieval Bible: Its Production, Decoration and Use (Cambridge: Cambridge University Press, 1994), pp. 24-52. Michael Gorman, 'Theodore of Canterbury, Hadrian of Nisda and Michael Lapidge', review of Biblical Commentaries from the Canterbury School of Theodore and Hadrian, ed. by Bernard Bischoff and Michael Lapidge, Cambridge Studies of Anglo-Saxon England, 10 (Cambridge: Cambridge University Press, 1994), Scriptorium: Revue internationale des études relative aux manuscrits, 50 (1996), 184-92 (p.186). Carol Farr, The Book of Kells: Its Function and Audience (London: British Library, 1997), p. 120. Richard Marsden, 'Ask What I am Called': The Anglo-Saxons and Their Bibles', in The Bible as Book: The Manuscript Tradition, ed. by John L. Sharpe III and Kimberly Van Kampen (London: British Library, 1998), pp. 145-176 (p.173). Michelle P. Brown and Patricia Lovett, The Historical Source Book for Scribes (London: British Library, 1999), pl. on p. 52. The Libraries of King Henry VIII, ed. by J. P. Carley, Corpus of British Medieval Library Catalogues, 7 (London: The British Library. 2000), p. xxxvi, n. 48. Michelle P. Brown, 'Female Book-Ownership and Production in Anglo-Saxon England: the Evidence of the Ninth-Century Prayerbooks', in Lexis and Texts in Early English: Studies presented to Jane Roberts, ed. by Christian J. Kay and Louise M. Sylvester, Costerus New Series, 133 (Amsterdam: Rodopi, 2001), pp. 45-68 (p. 55). Helmut Gneuss, Handlist of Anglo-Saxon Manuscripts: A List of Manuscripts and Manuscript Fragments Written or Owned in England up to 1100, Medieval and Renaissance Texts and Studies, 241 (Tempe: Arizona Center for Medieval and Renaissance Studies, 2001), no. 445. Michelle P. Brown, The Lindisfarne Gospels: Society, Spirituality and the Scribe (London: British Library, 2003), pp. 48, 55, 56, 151, 167-8, 171-178, 182-188, 190-191, 196n, 197n, 198n, 224, 236, 240, 246, 258, 265, 275, 300, 301, 316, 350, 401, fig. 25, 67. Michelle P. Brown, Painted Labyrinth: The World of the Lindisfarne Gospels (London: British Library, 2003), pl. on p. 20, p. 46. Michelle P. Brown, 'Preaching with the Pen: the Contribution of Insular Scribes to the Transmission of Sacred Text, from the 6th to 9th Centuries', University of London Annual Palaeography Lecture, January 2004, School of Advanced Study, Institute of English Studies, University of London, Centre for Manuscript and Print Studies, Courses & Events, ,[http://www2.sas.ac.uk/ies/cmps/Events/Lectures/2003/fulltext.htm], p. 13, 18 [accessed 3 April 2006]. K. L. Brown and R. J. Clark, ‘The Lindisfarne Gospels and Two Other 8th Century Anglo-Saxon/Insular Manuscripts: Pigment Identification by Raman Microscopy.’ Journal of Raman Spectroscopy 35 (2004), pp. 4-12. Michelle P. Brown, Manuscripts from the Anglo-Saxon Age (London: British Library, 2007), pls 34-35. Scot McKendrick and Kathleen Doyle, Bible Manuscripts: 1400 Years of Scribes and Scripture (London: British Library, 2007), p. 27, fig. 14. St Augustine's Abbey, Canterbury, ed. by B. C. Barker-Benfield, Corpus of British Medieval Library Catalogues, 13, 3 vols (London: British Library, 2008), p.1830. Richard W. Pfaff, The Liturgy in Medieval England: A History (Cambridge: University Press, 2009), p. 40. Scot McKendrick, John Lowden, and Kathleen Doyle, Royal Manuscripts: The Genius of Illumination (London: British Library, 2011), no. 1.